The team immediately shut down the project’s website and began trying to reach out to the company to try and work on an alternative outcome. After nearly two weeks of not being able to get ahold of anybody, a representative from the legal depart confirmed the Stage 9 team that CBS wasn’t going to budge and the game needed to stay down. CBS did not respond to a request by Kotaku for comment. A video posted just a few days before the cease and desist letter was received does a good job of showing just how ambitious Stage 9 was. In it, a player goes on a tour of a nearly complete Enterprise-D. Unlike Bridge Crew, which got a Star Trek: The Next Generation update earlier this year, players in the fan project aren’t stuck in a chair on the Enterprise-D’s bridge. Instead, they can move about the ship freely, riding turbo lifts, interacting with computer terminals, and even taking a shuttle craft out into space and get a view of the Enterprise from afar. While it’s more of a virtual tour than anything else, Stage 9 is much larger and more detailed, and as a result does a more complete job of capturing the ambiance and mood of one of science fiction’s most beloved starships. Stage 9 was named after the studio lot where the TV show was originally filmed. 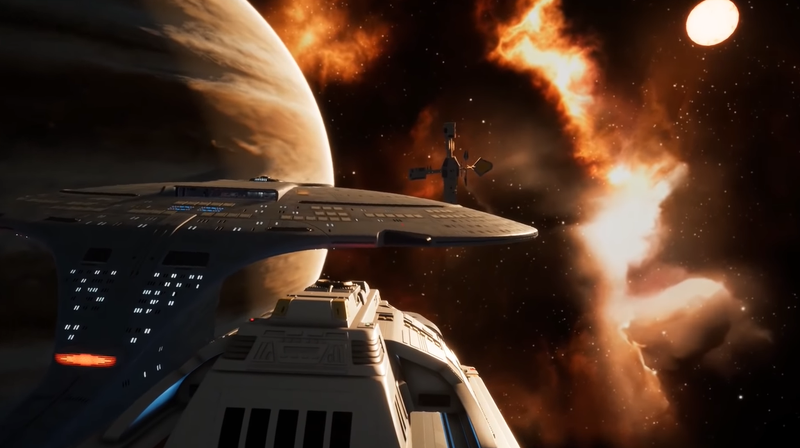 It was for PC but, like Bridge Crew, was also compatible with Oculus Rift and HTC Vive. Based on the videos, it would be hard to distinguish from a professional game. The project had originally been narrow in its goals—a few people trying to render a few parts of the original sets in Unreal. It soon grew into something much more ambitious. The group also felt emboldened by the themes of the show itself. “When Star Trek talks about equality throughout humankind, and a world where we’ve moved beyond the need for any money, it’s fair to say this project was more about respecting those ideals than anything else,” Scragnog said. In August, CBS announced a sequel to The Next Generation that would take place after the events of that show but still focus on its main protagonist, Captain Jean Luc-Picard (with Patrick Stewart returning to the role). timmyJACK and others who worked on Stage 9 told Kotaku that they remained hopeful this might make CBS more inclined to collaborate with them and view their own fan project as an authentic way of reconnecting with some of the original show’s most ardent fans. That’s why even after they received the cease and desist, many of them held out hope CBS might work with them to turn Stage 9 into something officially licensed, rather than scrapping it altogether.